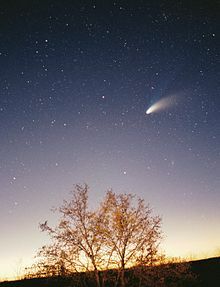 A new comet has been discovered that is predicted to blaze incredibly brilliantly in the skies during late 2013. With a perihelion passage of less than two million kilometres from the Sun on 28 November 2013, current predictions are of an object that will dazzle the eye at up to magnitude —16. That’s far brighter than the full Moon. If predictions hold true then C/2012 S1 will certainly be one of the greatest comets in human history, far outshining the memorable Comet Hale-Bopp of 1997 and very likely to outdo the long-awaited Comet Pan-STARRS (C/2011 L4) which is set to stun in March 2013.
via New comet might blaze brighter than the full Moon. Kevin Jarnot is a technologist who lives just South of Boston, MA. He is currently employed as Chief Technology Officer at Micronotes, an AI-driven conversation-marketing company based in Boston, MA. This entry was posted in Interesting, Science. Bookmark the permalink.